"Life Journeys": Conversations with High Achieving Men and Women of Kenya - Kenya's Women and Men of the Week. Conversations with High Achieving Men and Women of Kenya - Kenya's Women and Men of the Week. Thank you all for your kind words and support, and don't forget to click on the "Achievers Daily" tab to find out the latest news on our achievers. This week's Kenya's Women and Men of the Week are: Micro Financier and Gender Specialist, Dr. Jennifer Riria; Judge, Hon. Lady Justice Mary Atieno Ang'awa; Missionary and Writer, Marjorie Macgoye; Entrepreneur, Bharat Thakrar; Entrepreneur, Chris Kirubi; and Writer and Journalist, Oyunga Pala. The Group CEO of Kenya Women's Finance Trust, Dr. Jennifer Riria, is also a Board Member of Women's World Banking and the National Bank of Kenya, among other Memberships. In 2008, she was awarded the presidential award, Moran of the Burning Spear. She was recently, in 2009/2010, included in the "Heritage Who's Who" of International Business Leaders and Professionals Registry. My parents sacrificed everything to put their children through school. My mother was involved in all her children's education including that of the girls. She struggled a lot to get us through school and this has been my continued inspiration - to ease the economic burden of women and enable them to sustain themselves. KWFT was founded in 1981 by professional women from multiple professions in Kenya. The originally wanted to form a women's bank, but this was not possible due to Central Bank regulations and requirements, so instead, they formed a Trust. The trust started well in the early 1980s, as it addressed a significant need to support low-income women. We all contribute to running the house and do household chores, including going to the market. My daughters are my best friends and I love occasions like birthdays when we are all together, remembering the silly thing we have done and teasing each other. Once a year, we go on holiday together and we often shop together, which the girls enjoy because they get to spend all their mother's money! Hon. Lady Justice Mary Ang'awa's extensive civic experience, and service, may be unmatched. She has been involved in law in the United States, The UK, Tanzania, and Kenya. She has been a Judge in the High Court of Kenya since 1993, and she was the First Woman Chief Magistrate in Kenya. As recent as 2008, she was named International Woman of the Year, by the Association of the Adventist Women, for distinguished service in the public sector. I had initially thought to study Music, Art or Design with the intention of becoming a music teacher, however this changed after meeting a lady State Counsel from the Attorney Generals Chambers (seconded from UK) who paid us a visit in high school. I was the only girl in my class accepted to read law that year. What drives me as a person is the willingness to accept that God controls and plans our destiny. The choice is nonetheless ours. In my career I have faced various challenges including protesting advocates in 'change management situations'. Personally I consider challenges as good and healthy. I have led a good life and though the loss of my father took me a back for a while, my religion renewed my faith in God. My mother was a pillar of strength during trying times. Marjorie Macgoye literary works have touched many lives. Her book "Coming To Birth" won the much coveted Sinclar Prize for Fiction. She has also been a Missionary for the Anglican Church. Along with novels, she has also two collections on poetry, children's stories, historical studies and cultural criticisms. At all times, I was conscious of a call to missionary work and eventually in 1954, I was sent to Kenya. I am always grateful to my parents for letting me explore a new way of life and they remained in close contact, even if we did not meet often. God gives you gifts, so that when you apply yourself to a certain way of life - in my case, the service of the church in Africa - you do not choose where you are sent. My gratitude extends also to my christian colleagues, who have supported me. I had a strong mother-in-law, whose word was law in the Luo family. A fine old Christian lady, she loved and accepted me fully and lived with me during her final years. I had a satisfactory relationship with the family, but this does not mean my contacts were confined to the Luo clan and we had many friends from different communities. I have made many mistakes. I think, as you grow older, you realise that there are so many different situations you could have handled differently. The biggest lesson I have learned along the way is that I have sometimes been hasty and taken things for granted. Sometimes referred to as the father of advertising in Kenya, Bharat Thakrar, is the founder of the region’s largest advertising company – Scangroup, and a Director of all Scangroup subsidiaries. Known for his mentoring prowess, he has decades of experience in the Advertising and Communications industry and is a former Chairman of the Advertising Practitioners Association (APA). I was born when Nairobi was still referred to as ‘the green city in the sun’. The city was much greener with a lot less people. Traffic flowed, allowing you to easily move from one end of the town to the other in less than 10 minutes. Life was less complicated and the media was not as sophisticated. I established SCANAD alone and declared it open for business without a single client. It was a one man show, as I held all the positions from accountant to media manager. I pushed and believed that at the end of the day the final creative product was the most important. I reported on duty at 7:15 am and left around 11 pm every day, except on Sunday. Life is full of hurdles, but one must identify and categorize them into either the emotional or practical. When we become highly emotional we are unable to cope and create further problems. We should handle all situations with tranquility because without peace, one can get emotionally drained. Good-will is the best way to handle most situations. Chris Kirubi is a man of many definitions. He describes himself as an industrialist and entrepreneur whose interests lie in insurance, media, manufacturing among others. Some of Mr Kirubi’s holdings include the prestigious International House Building in Nairobi while he is also the largest individual shareholder in Centum Investments, DHL Kenya and Haco Tiger Brands. On the side, he is a Disc Jockey with his radio station, Capital Fm. Chris’s passion include empowering the youth in Africa. I was raised in abject poverty and was educated by well wishers. While studying, I also found a way to support my brother’s education and he is currently a professor at the United States International University. My difficult background did not deter me from succeeding and I never contemplated failure despite not always having requisite means or close people to turn to. Poverty motivates those who have tasted its impact and I was lucky to benefit from the support and advice of valuable friends. Good advice is more valuable than money. I once asked a friend why people talk about me and he told me that I should only worry when they stop talking because I will have ceased to be important. I know that it is not possible for everyone to believe in what you do, but I choose to delight in the fact that people take time to notice. Good health is vital and is the one blessing I would wish to keep if everything else were to be taken away. My brain is part of that well being. Joy and sadness both make me cry although I think I cry more from joy than sadness. I cried a lot when my daughter Maryann was getting married. Oyunga Pala is a satirical columnist and renowned journalist. For ten years, he weekly authored the ‘Mantalk’ Column which he used as a platform to address the challenges of the contemporary male in the Saturday Magazine of the Daily Nation Newspaper. Pala was editor of Kenya’s first sports magazine and the first editor of the men’s lifestyle brand, Adam magazine. His work is dedicated to positively impacting the youth with vision and drive, which he exemplifies through his dedication and success. "Writing for a living is a humbling endeavour because without positive acknowledgement from readers one ceases to exist as a writer. You are only as good as your last story. The ‘Man Talk’ column was a result of an audience from my earlier contributions to the magazine pullout. It was an examination of the identity of the Kenyan man. I attempted to define this national identity through the perspective of those bred within our Kenyan borders. I am largely a product of good mentors as I learned the benefit of mentoring at an early stage of my life. 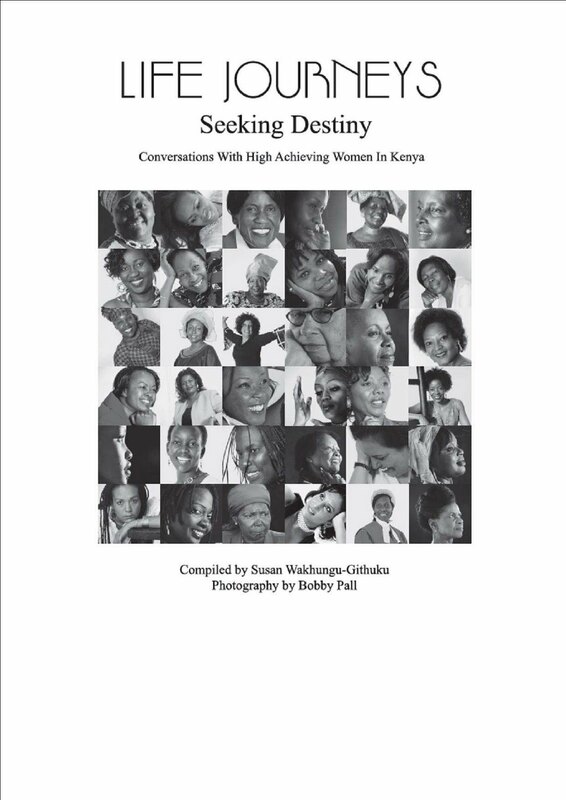 It started with my father Henry Odhiambo Nyadwe and later, while dabbling in print, individuals such as Absalom Mutere (Bimbo), Hillary Ng’weno, Charles Onyango Obbo, and Taban Loliyong contributed precious nuggets to my thinking. I have always sought the company of people I admired and one common trait I noticed is their “so what?” attitude toward their work, no matter how monumental. What matters - for them - is what they are doing now, not dwelling on past glory. 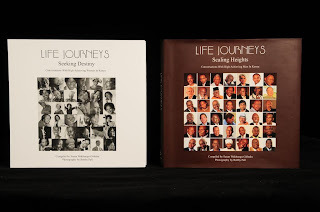 Read more of these stories and others in "Life Journeys: Seeking Destiny,"(Women achievers) and "Life Journeys: Scaling Heights," (Male achievers) two ground breaking coffee-table books that present written vignettes of high-achieving women and men in Kenya. 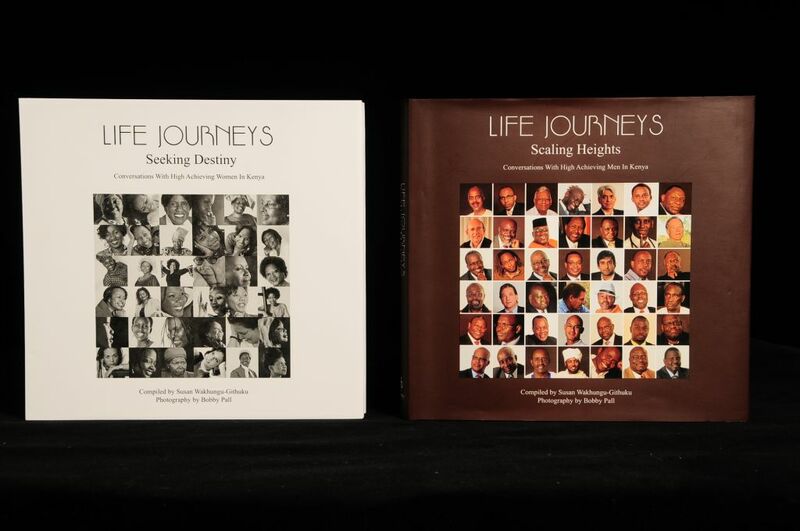 Both "Life Journeys: Seeking Destiny," and "Life Journeys: Scaling Heights" are available at Bookstop in Yaya, Text Book Center in Sarit Centre and Junction, Savanis Bookstore in Westgate, Prestige next to 20th Century, African Book Service off Koinange Street, and Lisa's at Muthaiga Shopping Centre.